Bring in a guarantor for your tenant using this agreement. It supplements any residential tenancy agreement. 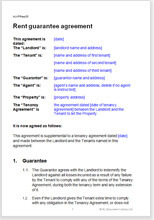 This is a short agreement to bring in a guarantor to a residential tenancy agreement. The guarantor provides a promise to pay rent unpaid by one or more of the tenants and also for any loss or damage caused by the tenant. To use this template, simply download for free, edit lightly (most edits required are for names and addresses) and ask the guarantor to sign. Once you have also signed, the agreement is legally binding. Having witnesses sign isn't necessary for the legality of the document, but we provide for it to reduce the probability that someone other than the guarantor signs. If you let your property to more than one tenant, you will probably use a tenancy agreement that gives your tenants joint and several liability to pay the rent. This means your tenants are jointly responsible for the total rent, even if they decide between themselves how to split payment of it. The advantage to the landlord of renting on a joint and several liability basis is that he or she can pursue any of the tenants for any unpaid rent. Effectively, the risk that one of the tenants might not pay the rent is transferred to the other tenants, not the landlord. A rent guarantee agreement brings in a guarantor on the same basis as the tenancy agreement. So if the tenants are jointly and severally liable, the guarantor will be as well. A guarantor is unlikely to be happy to guarantee the rent of tenants he or she does not know (such as in the case of parents guaranteeing the rent for a property in which a child lives with other friends). While capping the amount guaranteed is one way to make the guarantor happier, it does transfer risk back to the landlord. The landlord might prefer not to bring in the guarantor, but instead ask for more rent in advance, or a larger deposit. Enforcing a guarantee is time consuming and costly. Landlords are better to treat them as a tool to remind tenants to pay than as full security. Including one doesn't reduce the need to vet tenants well before they sign the tenancy agreement. Rent guarantees are best included in the tenancy agreement, rather than in a separate document. The reason is that tenants gain rights when the tenancy agreement comes into effect (usually when signed).